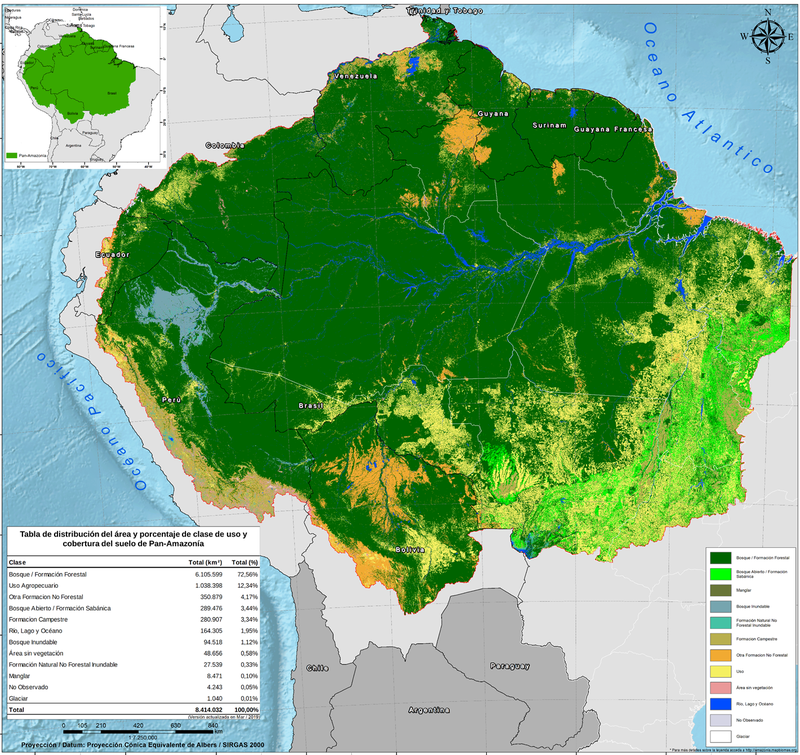 This information was revealed in the first collection of maps made by RAISG and Mapbiomas, who developed an advanced technology tool to track the pressures over the Amazon rainforest. MapBiomas tool monitors the use of soil changes of the Amazon and follows the pressures over the rainforest. This new analysis covers 9 countries of the region, 21 types of soil cover and 6 biomes (Amazon, Cerrado, Marshland, Andes, Chaco-Chiquitano y Bolivian Tucumano). The obtained results point that during 2000 and 2017 period, and despite of conserving 85% of the native forests cover, the region lost 29,5 million hectares, a territory equivalent to Ecuador. On the other hand, during the same period there was a 41% growing of the agriculture and livestock area. This is the first mapping of the region compatible and standardized to every country, which allows to know the vegetation cover state, the tendencies and changes of soil use, like the substitution of forest by crops or pastures. On the Amazon region level, it is a novelty to have access to information with maximum space resolution of 30 meters with such level of detail and analysis precision is a breakthrough. 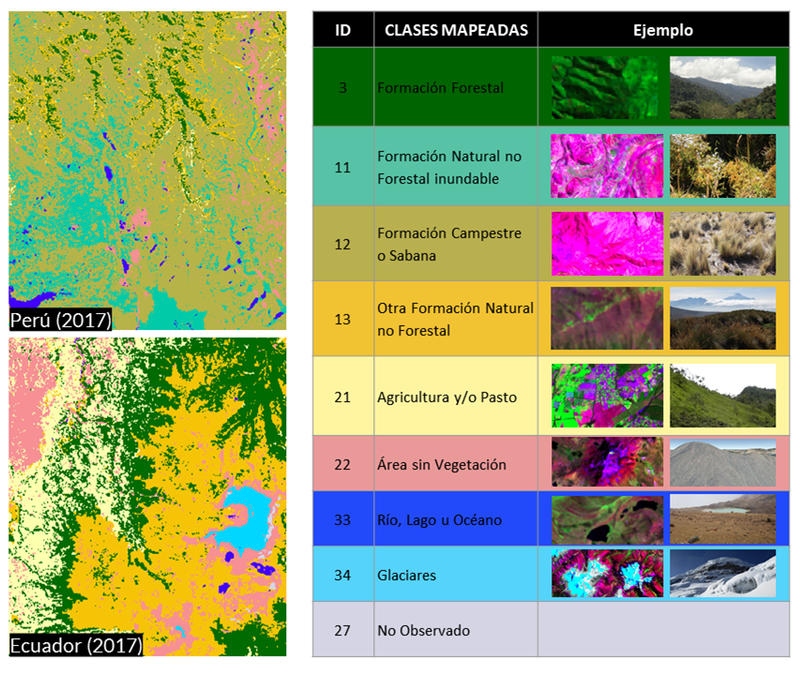 The tool was developed by MapBiomas Amazonia and the data-processing was made using algorithms for automatic classification trough cloud computing on the Google Earth Engine platform. For Beto Ricardo, RAISG coordinator, “this is an important progress to the objective of building and encourage an integral vision of the Amazon, considering political and socio-environmental aspects of great importance such as the presence of 400 indigenous peoples, hydrographic shared basins, connectivity between unites of conservation, pressures and threats on the Amazon. Also, Tasso Azevedo, general coordinator of MapBiomas thinks that “the value of this database is priceless, since it contributes to the understanding of the use of natural resources of the region, the calculation of greenhouse gas emissions by the change of soil use”. The public access platform is is now available, is interactive and allows to obtain figures and graphics. 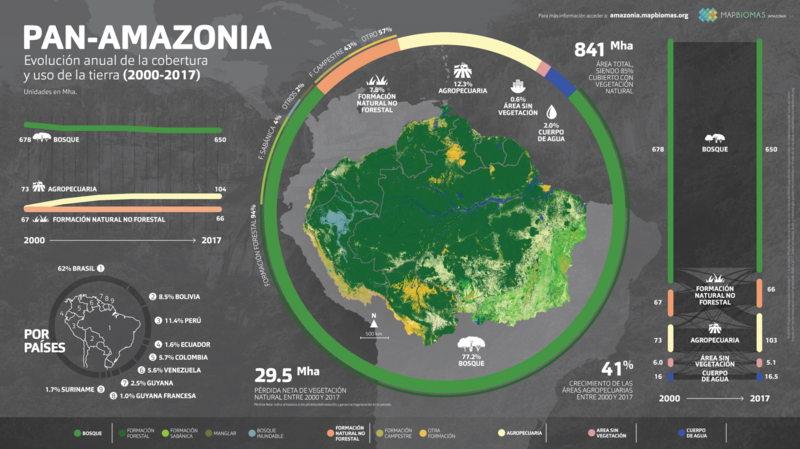 Thanks to its flexible character, the general public can visualize the maps on the Amazon region, country, Protected Areas and Indigenous Territories. For every country, it is possible to visualize the information by state, region, department. In the elaboration of maps, the work has been done under the network modality of RAISG, drawing on the expertise of the member organizations of their respective countries. In this way, the existing knowledge at the local level has made it possible to improve the tool and to refine the interpretation of the data. The information from each of the partner countries is perfectly compatible with the others, allowing a comprehensive vision of the Amazon region. Initially, the mapping of soil use was developed by MapBiomas to be applied only in Brazil, but it had to be refined with the contribution of the member organizations of RAISG to adjust the results and analysis to the geography of each of the Amazon countries. In particular, it was necessary to take into account the altitudinal variations of the Andean Amazon. Perfecting the tool required intense work over a year and a half, and now RAISG – MapBiomas present this important input for decision makers and civil society.